Chocolate and Cheese. Few foods have a history as rich or as complex. When you throw in amazing flavor, you have two of the most beloved tastes in all of history. Explore everything both have to offer at the Chocolate & Cheese Festival on March 30 and 31. 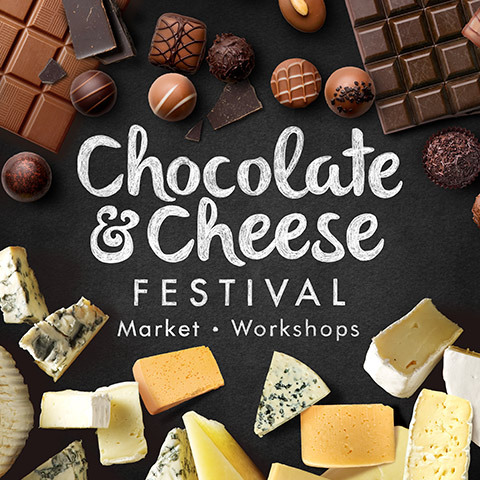 The Museum is hosting the best local producers and purveyors of chocolate and cheese in one of Utah's best food markets for this two-day extravaganza. If this is your first time, please note that the market is the main event of the festival. The workshops are an incredible extra we offer with the help of our generous partners. Museum admission is required in addition to workshop fees. Click the buttons below to see and register for our popular Chocolate & Cheese Workshops on either Saturday or Sunday. These workshops tend to sell out in advance. New this year, Harmons is hosting a Fermented Food Market on the fifth floor of the Museum during the Chocolate & Cheese Festival, adding to the wide range of flavors including makers of fine ginger beers, kombucha, pickles, goat cheese, coffee, and more. Regular Museum admission required for the festival.